Only necessary data needed by Google analytics agent are saved. No other information is registred on the site cmfgroupe.com . By using this site you accept the use of these cookies. CMF Groupe research, develops, design, integrate, produce, assemble, test and install single special machine up to complete production lines, according to customers’ specifications, all over the world. CMF Groupe with a dedicated and experienced project team will implement your project in the most demanding environment, our leading mechanical, electrical and automation engineer will develop your own efficient production facilities based upon proven,reliable and tested new technology. Our expert customer support team will be at your service all over the world to support you in your daily operation. CMF is your best partner in securing productivity for your next investment. CMF Groupe performs in the following industrial sectors : Aerospace, Automotive, Defense, Energy, Environment, Railway, Shipyards. CMF subsidiaries in China and Romania support our international strategy of serving our customers wherever they set their activities. CMF Groupe provides design, custom building and installation on site with training and after-sales service all over the world. CMF Groupe has a long expertise and experience in designing special machines or prototypes adapted to the needs of our customers. Thanks to such expertise, CMF thrives all over the world and thus has delivered and installed more than 700 machines in 50 different countries. Our quality is recognized all over the world, we make our machines high-tech and custom-built. CMF Groupe focuses on developing innovations and increasing our knowledge and expertise, in order to keep its technical advance upon competitors. 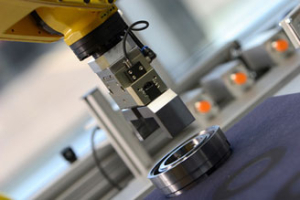 Our non-stop innovation tradition aims at improving existing technologies and designs of machines, with long-term experience and constant link with our customers. Providing more reliable products to our customers, coping with increasing demands for profitability, quality and advanced technology are always our priority. To cope with this constant pressure, event BE “Design and manufacture of special machines” CMF Groupe is certified with ISO 9001. CMF Groupe wants to follow his customers in the world and we provide after sale service to insure that the machines are non stop working. We believe that a good after sales support is as important as the performance of our products. We can guaranty to our customers an intervention within 48 hours.